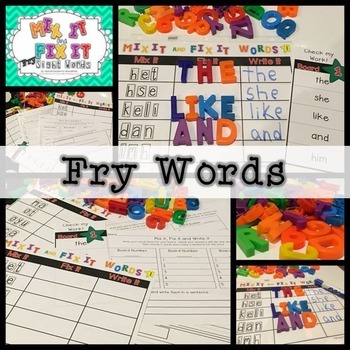 This FRY sight word hands-on differentiated literacy center engages students and gets them excited about learning their high frequency words! * This will be updated to include the next 100 words. Purchase it now and then get the updated words for free. 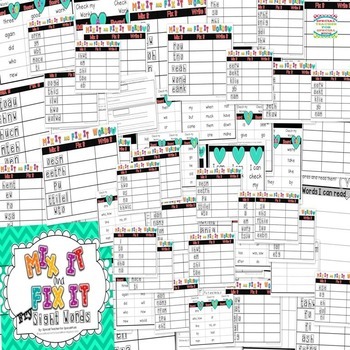 *Copy, laminate or insert into a sheet protector, the full color mats. 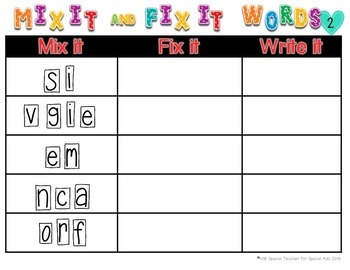 Each board is numbered for easy tracking Students will be able to practice "fixing" the word using letter cards, letter stamps, magnets (not included), dry erase makers. Then they write the word they just fixed. Learning while having fun! ** Practice Beginning and Ending Sounds for words. Aligned with the Common Core- ELA Foundational Skills. 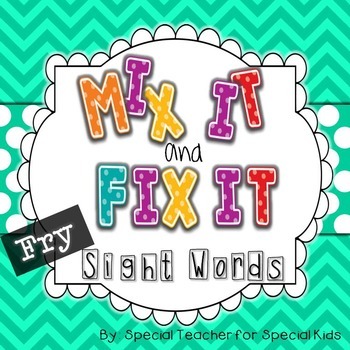 This resource is perfect for review, or reinforcement or formally assess word identification in small groups. Please consider leaving feedback after downloading this product. Leaving feedback allows us to keep our materials up to date and you earn TpT rewards. Don't forget to follow the Special Teacher for Special Kids Teachers pay Teachers store for new products and notifications of product revisions and additions. If you like what you see, check out the sites below for more freebies, links, and ideas!